Stacey Alcorn is the owner and CEO of Laer Realty Partners, which has 20 offices throughout the state. She works 60 to 70 hours a week. On the side, she blogs and lectures. Last year, Alcorn spent more than $100 assembling a “Frozen” Princess Elsa costume for Oshyn. She went to the online site Etsy, which features handmade and vintage items, and found a blue princess dress and a wig made of yarn. “I figure that if I have an extra four hours, I’d rather spend time with my daughter than make a costume,” Alcorn says. 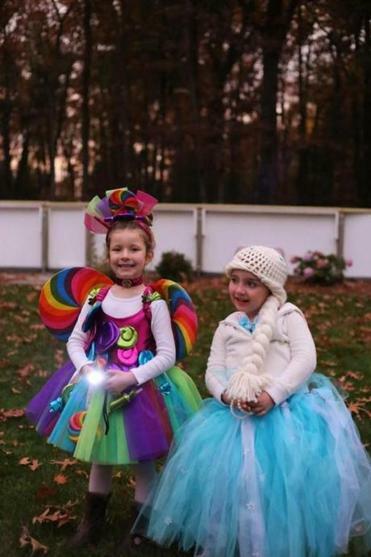 Stacey Alcorn spent more than $100 assembling an Elsa costume for daughter Oshyn. She is not the only one shelling out big bucks for Halloween costumes that, like a wedding dress, might be worn only one night. Companies such as The Land of Nod, headquartered in Chicago, and the Seattle-based online retailer Chasing Fireflies offer costumes that can cost more than $200. Take a froofy get-up called the Harajuku Lovers Kawaii Candy Fairy Princess, which Chasing Fireflies sells for a cool $150. That doesn’t include the wig ($30), wings ($40), wand ($14), headband ($18), or petticoat ($31). So if your princess wants to look just like the princess in the catalog, it will cost you $283. But at least one thing is free: shipping, for orders more than $75. Or your kid can be a pirate captain for $158, a mummy for $82. The Land of Nod, a retailer of children’s furniture and accessories, offers a weightlifter costume for your 3- to 7-year-old for $79. (A modest counter-proposal: Dress your mini Schwarzenegger in a tank top and shorts, get a couple of fake tattoos, and make a barbell out of tin cans and a stick). Meanwhile, over at DisneyStore.com, a light-up Elsa costume is on sale for just $119.97, down from $199.95. And you can get a Jasmine “limited edition” costume for $149.95. The demand for these well-known and licensed characters is one reason for the higher price tags. And for a few well-heeled parents — eager and financially able to grant their children’s wishes — price seems to be no object. “To get that branded costume, you’re going to pay more,” says Chris Cassel, who owns Boston Costume. Sometimes a lot more. Christine Rose made scuba diver costumes for her sons, John and James. The costumes cost almost nothing. Of course, the majority of shoppers won’t spend big bucks on their kids’ costumes, or their own. This Halloween, the average consumer plans to spend an average of $27.33 on costumes for the whole family, according to a new survey by the National Retail Federation. That totals some $2.5 billion nationwide. Last year was an aquatic theme. Rose was a mermaid, her husband, Bryan, a shark. 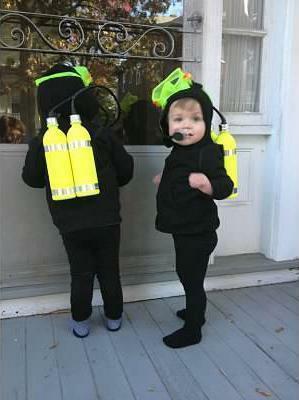 The boys — James, then a year old, and John, 2 — were very cute scuba divers. Rose made all four costumes. For the boys, she used black hooded sweatshirts, black leggings, and scuba masks. The “tanks” were painted water bottles. Most of the stuff she already had around their Foxborough home. Mary Barrett is a grandmother, and an expert on all things Halloween. For 24 years, “Scary Mary,” as she is known, has run Barrett’s Haunted Mansion in Abington, which hosts about 30,000 visitors a season. Some things she buys online, because it’s cheaper. She also goes to consignment shops. Last year, she went to a party store for a costume for her grandson. “Every single one of them were so expensive, especially if you go from head to toe, and he was just a year old,” Barrett says. She didn’t buy. At CostumeExpress.com, the top sellers this year are characters from “Star Wars,” “Batman,” Nick Jr.’s “Paw Patrol,” “The Avengers,” “Minions,” “Jurassic World,” and, yes, still “Frozen,” says chief merchandising officer Bob Humphrey. Prices vary on the site from about $25.99 to $49.99 for a kid’s superhero costume, but Humphrey thinks the expense is well worth it. “Parents know costumes can be used well before and after Halloween for pretend play and dress-up and it is, in fact, an important part of childhood development,” he says. Jessica Barsamian is another working mom. Director of operations for the Belgrade Group, a group of hair salons in the Boston area, Barsamian has a 6-year-old son, a 4-year-old daughter, and is expecting her third baby in November. Last year, her son William wanted to be Ringo Starr, a costume that ran $60. Daughter Fiona was Elsa, at $40. This year, her son is going to be the Hulk ($40), as is her husband ($70). Fiona is going to be the children’s book character Madeline and wants her mother to be the head nun. Barsamian found a Madeline costume on Etsy for $38, and a nun’s outfit on Amazon for $10, “my best deal ever.” This year, she will go as a very pregnant nun. 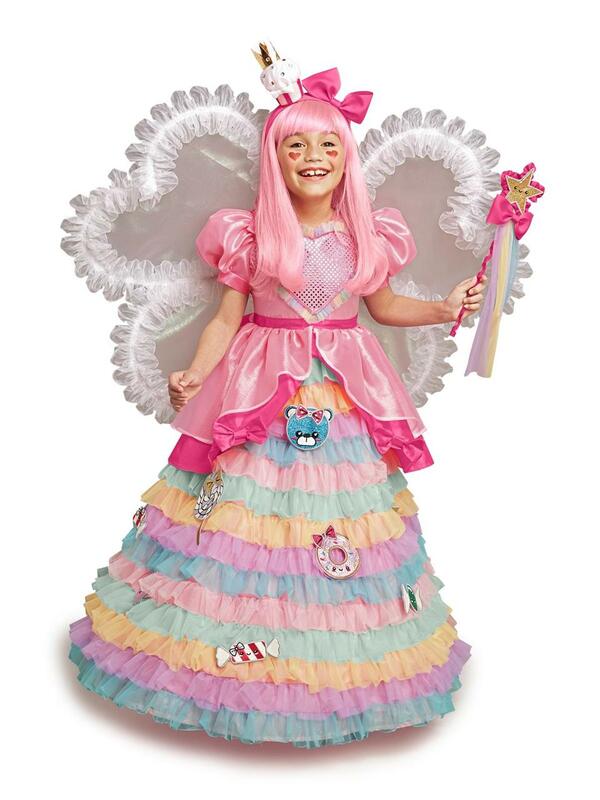 Harajuku Lovers Kawaii Candy Fairy Princess costume from Chasing Fireflies.